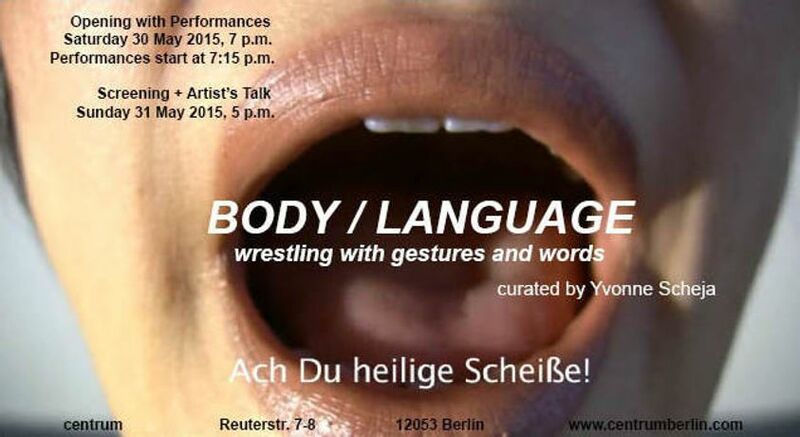 BODY / LANGUAGE – wrestling with gestures and words is a two-day project focussing on performance as artistic medium. The title reflects the essential components of performative works, and refers to the main means of communication that also constitute our identity: body, language, and body language. But what happens if they are wilfully manipulated or distorted, or if there is a lack of knowledge of codes and rituals of a language or of a certain cultural sphere so that communication becomes hindered or even completely impossible? Bearing these questions in mind the artists Lucie Mercadal (*1987 in Besançon, France), kate hers RHEE (*n.s. in Seoul, Korea, raised in the USA) and Rizki Resa Utama (*1982 in Bandung, Indonesia) followed the invitation to approach the complex term BODY / LANGUAGE through performance. In 1, 2, 3 – Liebelei Lucie Mercadal plays with the expectations of communication partners and confronts them with these, while RHEE in her work Asians are the new Jews tackles the problem of Asians and Jews as so-called "model minorities" and generally ethnic discrimination within societies. Both artists will present their new works for the first time. In Today Utama asks to which extent the simultaneous use of different languages leads to an individual expression, characterised and intermingled by diverse cultural influences. On the second day, after a screening of their video works, the three artists will discuss the wrestling with gestures and words.